It’s the time of year for enjoying a cup of hot cocoa in front of a toasty fire! When heading outdoors, wool fabrics, layering & coats become a necessity. This year we are sewing our little hearts out with a fast & simple shawl/cape pattern that hits on the current trends & keeps you warm at the same time. This staple garment is easy & fast to sew, warm and comfortable to wear! 2 yards of a 60″ wide fabric is enough to create a pretty scarf as well as a shawl/cape. Remove 10″ X 60″ down one selvage edge. This will create the material needed for a scarf. Fabric remaining will be 2 yards X 50″ wide & will be the amount needed for a shawl. Remove the remaining selvage edge from the fabric by trimming approximately 1/2″ – 5/8″ down the length of the 2 yards. Establish the ‘front’ & ‘back’ of your shawl, based on your personal preference and the design of the fabric. On the fold of the fabric measure up 35″ from front edge, as shown. Cut out a rounded edge 2.25″ deep X 35″ long to the end of the fabric, creating the area that will go around your neck. Buy a kit from Farmhouse Fabrics for pre-coordinated shawl/scarves that will include a pattern for the rounded neck of the shawl. Depending on the weave of your fabric, one way to finish the bottom ends is to fringe the edges by removing horizontal threads to the desired depth of the fringe. If sewing with a wool or flannel fabric (one that is made with a looser weave), try fringing the edge to finish the look. Once the fringe is complete, it is time to finish the side edges and the center front by topstitching a narrow turned hem. If desired, you could serge the raw edges and turn under & topstitch. Or, turn the edges under twice and topstitch. Some fabrics will not fringe, so just make a narrow hem around the entire shawl/cape by topstitching. To complete the scarf fringe both ends to the desired depth and finish both long edges – voila’! Stay cozy and comfy with a wardrobe of these cute capes and scarves! There’s something about the taste of a layer cake that makes it so decadent & delicious! 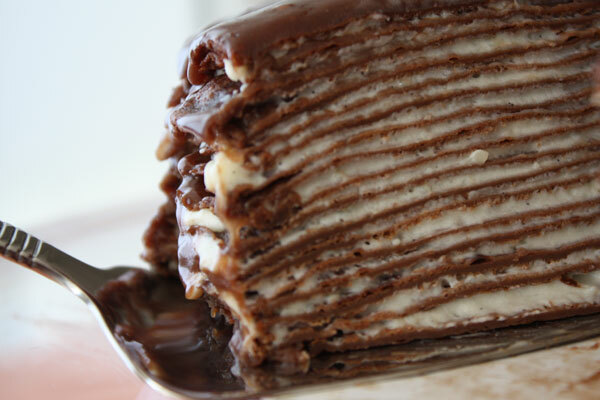 There’s a depth of richness that happens when you stack all those yummy layers together. It is much like the richness that layers of fabric can bring to a dress! When I was asked to sew flower girl dresses for two of my granddaughters in their first walk down the aisle, I welcomed the opportunity. Creating garments for special occasions is an exciting venture and can be quite a challenge. A wedding is an important event, and the photos will be enjoyed for generations to come. I feel the pressure to create the right look, knowing it is important for the girls’ dresses to coordinate with both the bride’s gown and the bridesmaids’ dresses. The bride and her mom selected the lace fabric and gave me free rein! I was thrilled to sew for this special occasion (and for my granddaughters!). The color of the bridesmaids’ dresses was “Biscotti” – a “neutral-taupe-hint of pink-ish” color. I had a photo only…and was trying to decide on the perfect color lining for this embroidered bobbinette fabric. Ivory lining made the dresses too creamy looking. Taupe lining made the dresses too “adult” looking. Nothing seemed to be “just right”. I needed to tone down the ivory while playing up the soft pink-taupe hues of the embroidered netting. So, in order to accomplish my netting fabric ‘color-change’, I began to “layer my cake”! After pulling satins & silks, polyesters & nylons, pinks & whites, creams & taupe; my dresses began to take shape! I finally decided on a pale blush pink silk faille fabric, ivory silk crepe de chine & the embroidered bobbinette fabric as the sheer overlay . The faille silk fabric had a light enough pink undertone to create the exact color that was needed, topped by the ivory of the silk & netting. Thankfully the pink faille fabric added just the right amount of opacity so that I didn’t have to add a slip. I was going for a “color” – no matter what fabric I had to use to get that shade! If there had been a soft blush pink fabric in a different type silk, or even a cotton or a polyester lining, I would have preferred to use it. Faille has a texture and is really heavier than I needed a lining to be for this dress. Faille has an obvious cross-grain (kind of like Swiss wale pique, but the lines run from selvage to selvage). The “normal” way to cut & sew a skirt lining, the “straight of the grain” is the direction of the selvage edge. However, due to the texture of this fabric creating a strong cross-grain, gathering the top of the skirt lining became an issue. The faille weave wants to “pouf” when gathered. So, to avoid the “pouf”, I cut the skirt pieces opposite the grain – having the textured lines running vertically, and the fabric then gathered beautifully! 1. Since the bobbinette has one embroidered border edge, I cut the entire skirt in one piece, using 90″ of length. This allows for one seam in the back of the skirt. 2. The silk crepe de chine was cut in two pieces, the full width to correspond with the width of the bobbinette. This fabric had side seams, and then I added a placket at the center skirt back. 3. The bobbinette was placed over the crepe de chine and the two layers were gathered together using 3 rows of gathering stitches. (The wrong side of the bobbinette was placed on the RIGHT side of the crepe de chine – so no seam allowances showed through the bobbinette). 4. This double skirt layer was then attached to the bodice. 5. The silk faille was cut with less width than the top two layers (approximately 60″ total width). Since it is cut “cross-grain”, like a border print would be cut, it only required one back seam, and that was sewn leaving approximately a 6″ opening at the top of the center back, which could be finished like a placket. The silk faille was then gathered, using 3 rows of gathering stitches, and then it was sewn to the dress bodice, wrong sides together. Now, all the seams were hidden! Everything came together perfectly – and the final color created by “layering” was just right! The girls were ready to walk down the aisle sprinkling rose petals for a gorgeous bride. The bride, her flower girls & the entire wedding was absolutely beautiful! Jane Cely ~ Exactness in Expertise! Jane Cely was the youngest person in her hometown of Anderson, SC to be taught how to sew & to purchase a sewing machine from her local Singer shop. Since the sixth grade, Jane has continued to sew for herself, her grandchildren & beyond! After retiring from teaching math, Jane took on a whole new career. When challenged by her friend to sew a special dress for a prestigious kindergarten graduation, Jane was up for the challenge. Her attention to detail, good taste and having a mind for numbers has produced stunning creations that will be treasured for generation after generation. Through word of mouth & exquisitely sewn dresses worn by little girls at graduation, Jane has now ventured into the very busy land of custom sewing “heirloom” garments. The picture below shows Jane’s handiwork worn by several happy kindergarten graduates! Each dress is unique and special! We wanted to know what it takes for Jane to create these one-of-a-kind masterpieces like her most recent flower girl & first communion dress (shown below). Phone call from customer requesting dress – Jane asks them to get together pictures of dresses that they like. She suggests the customer look over laces at FarmhouseFabrics.com and start their list. Meets at customer’s or Jane’s home – looks over dresses & decides what style the customer is wanting. Jane takes old issues of Sew Beautiful and Australian Smocking Magazines to give examples of heirloom gowns..and help give direction, if needed. Jane starts with sketching of the bodice & lace placement & creates a detailed list of desired materials. When she adds the yardage of all the selected laces, fabrics, buttons, ribbon, she writes each item on a separate post-it note. Jane attaches all sketches & notes on a push-pin board as a design board for each customer. Time to bring list of lace & fabric to Farmhouse. Jane has already “done the math”, figuring exactly where every piece of lace will be placed. She predetermines the width of the skirt, which is necessary to know the exact amount of lace to purchase. As seen in the photo of the 7 little girls above, there usually are many rows of lace going around the circumference of the skirt!! Before cutting into the expensive garment fabric, Jane makes a “muslin” bodice with one sleeve to try on the child for correct fit. Final step – Jane sews the dress and measures hemline for final fit. She is VERY happy when her lace calculations are EXACT!! She is always looking out for the best for her customers, keeping the lace yardage as close as possible. On her last garment, Jane had only an inch of insertion remaining after the garment was constructed! You’ve never met a kinder person. We call her the “Queen of Heirloom”. She is a busy lady – traveling out of town to her grandchildren’s sports games, baby sitting, substitute teaching, maybe squeezing in a trip to Europe, taking sewing classes around the country and tackling the heirloom world. We love Jane Cely, and we hope you have enjoyed a little introduction to this beautiful lady and her gorgeous creations! Her “exacting” techniques of planning an heirloom garment can make it as easy as 1-2-3!! Preparing for our Fall 2018 Classic Sewing Magazine advertisement brought us great joys & adventures with these 3 rambunctious boys! But even through the purposeful face-plants, these handsome brothers couldn’t hide the sweetness in the ‘Robert’ pattern by Children’s Corner Patterns. Plaid & corduroy are such staple fabrics for Fall! The twins are in coordinating Blue & Red brushed plaid flannel shirts & our little red is in the sweet Hunter green corduroy. When planning for this outfit, we thought our little country boys would look great in their Fall best with cowboy boots, blue jeans and an untucked shirt. To match this look, I decided to alter the ‘Robert’ pattern to include a shirttail hem. The hemline alteration is quite simple. Add about 1 1/2″ to the hemline at the front and back, and then curve the hem to the side seams at the original hemline. For measuring tools like these click here! Finish with a narrow “double” folded hem, top-stitched. In the end, the boys decided to wear their overalls, so the shirttail hem didn’t matter for these pictures. We do love the look, though! This is a great little boy pattern! We highly recommend “Robert” by Children’s Corner Patterns! Here are some outtakes of our rascally boys!!! Joe and I couldn’t wait for our family vacation with 3 of our 5 sons and their families. This year we selected a place at Edisto Beach, SC that could accommodate the 10 children and 8 adults who planned to go. This was the first time we have ever had the opportunity to plan a “family beach photo”! Beautiful setting, lots of fun grandkids… time to coordinate some outfits!! With the beach setting in mind (and so many girls), our thoughts were heading towards a maxi dress and a flowy fabric! In searching for a pattern that would suit an age range from 10 months to 9 years and every body shape in between, I found the ideal pattern – Little Lizard King Patterns great new PDF ‘Sorrento’ pattern that is sized for 12 months – 14 years. A sheer Swiss voile floral fabric named ‘Fragile Beauty’ started to catch my eye as I fluttered around the shop pulling fabrics for our beach maxi’s. Simple & elegant, this voile was perfect for their dresses. Laying out the pattern & fabric, this project was finally starting to take shape. “Fragile Beauty” voile has a creamy ecru background, and one of the first decisions to make was which color to use for a lining. If I matched the lining to the background of the voile, the dresses seemed too dark for young girls and for the look I was attempting to achieve. So, on a whim, I tried the “antique white batiste”, and while it doesn’t “match” the fabric, it lightened the overall final look, and seemed more “little girly” (plus, made a better coordinate with the little boys’ white shirts and khaki shorts. LINING SELECTION….. This is a picture of the voile shown over both the antique white (on the left) and the cream (on the right) fabrics – trying to decide which would work the best. UNDER LINED….. Due to the sheerness of the voile, I felt it was important to “underline” the bodice front and back. Underlining is accomplished by putting a layer of the printed voile on top of a layer of the lining, and pinning or basting the two layers together. The new “2-layer” piece would be sewn as one layer. The bodice front and back pieces are also fully lined, so there are 3 layers of fabric on the bodice. STRAPS/TIES – Another variation – instead of shoulder straps, ties (could use ribbon) were attached at the front bodice and back bodice and tied at the shoulder in a bow. This allowed for minor length adjustments when necessary. The bodice on our baby’s dress was shortened by at least 3″ – seemed sweeter on one so tiny. Also, with the all of the dresses except the baby’s dress, the skirt lining and voile pieces were the same width and were gathered together. On the baby’s dress, the voile was gathered and attached separately from the skirt lining, and it made such a pretty, airy “fluffy” look for her. She didn’t need the fullness in the skirt, like the older girls needed. Sweet and simple hair accessories can be made in minutes with pretty little fabric flowers, alligator clips and a hot glue gun! Pleating With or Without Interfacing – That is the question. Recently we read a discussion on Facebook about pleating with or without a fabric stabilizer. The person writing the post was using one of our recent “Flash Sale” – Gorgeous Swiss wool-polyester blend challis fabrics! This drapey fabric seems perfect for many projects. . . warm or cold weather, children’s or adult clothing, dresses, tops, shawls … but what happens when you want to pleat this type of fabric? The hand of this beautiful fabric is soft, and it drapes beautifully. One would think that because it runs through a smocking pleater like a dream, that surely it wouldn’t become a nightmare after removing it from the pleater needles! The drapey hand of this fabric can make pleating seem like a sinister game! haha! The fabric would not return to its original, crisp, even pleats. There was too much “bounciness” in the challis. There were several excellent responses on Facebook to the original post about the struggle to pleat and have a good result. We were curious about which would work best for us, so gave it a little test! Several folks suggested using a lightweight fusible interfacing on the back of the challis prior to pleating. But which interfacing would be the best for the job? We offer several different weights of interfacing that are appropriate for fabrics just like this poly-wool challis. Baby Interfacing & German Interfacing were our first choices. They lend themselves to lighter weight fabrics & they adhere to fabrics in a way that helps leave the fabric in it’s original form, not changing the weight or hand drastically. When preparing your fabric before attaching interfacing, we want to make sure that the grain of our 2 fabrics is going in the same direction. This helps to make the fabric & interfacing act as one, moving & stretching in the same direction. An easy way to do this is line up your selvage edge for both fabrics before ironing! 3. Lay project fabric face down on the ironing board, then place interfacing fabric with fusible side down (this will be on the back side of the project fabric). The glue/fusible side of the interfacing has a slightly textured feel. 5. Make sure that the entire section of interfacing has completely adhered to the fabric before moving on to the next step! This will be important when pleating the two fabrics as one piece. If the interfacing has places that have not completely adhered, the interfacing will wrinkle when it is rolled onto the dowel rod. A few pointers that we just learned about our baby interfacing came from Joy Welsh of ‘Applique for Kids’ during her recent trip to Farmhouse Fabrics! 2. Using a pressing cloth, place your iron on one section of the fabric/interfacing combo and let it rest for 10 seconds before moving to another section. So, all in all, use an interfacing with a drapey fabric to help make pretty pleats! But, it depends on what you’re wanting from your project as to which interfacing to use. Baby Interfacing is a little lighter weight than German Interfacing. The Baby Interfacing changed the fabric the least, but German Interfacing made the pleats the most straight. If you are wanting a very defined pleat, use German. If you are most concerned about the softness of the hand in the pleated area, Baby Interfacing is the stabilizer to use! Farmhouse Fabrics had a very fortunate “FIND” with this group of elegant Swiss fabrics!! They are so ideal for our mild winters, and they will make cozy garments for our Northern friends, as well! We love the Swiss poly-wool blends, because they are machine washable, and our little ones can wear them without anyone worrying about the fabric care!! We have many gorgeous colors – keep watching for more on our website! Please send us photos of your sewing projects! We would like to share them to inspire others. Other wool fabrics that you might want to try! For great step-by-step video tutorials like using a pleater or construction of some of the above patterns, visit Sarah Classic Sewing YouTube page at https://www.youtube.com/channel/UCVmLsNfMmmLiGOV9uGfwMwQ!!! 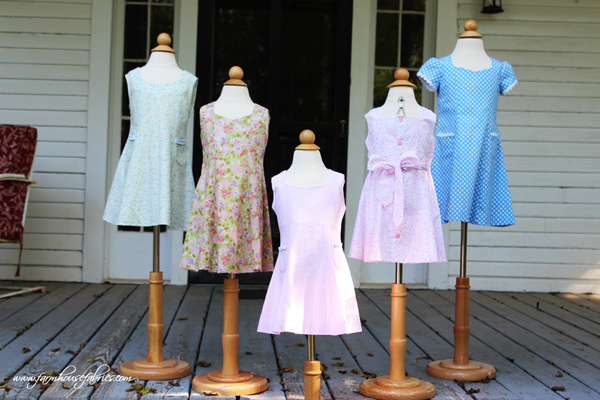 We adore vintage style garments and their sweet styles & nostalgic allure! Our recent inspiration came from ‘Lila’s Sundress’, the included pattern from the Summer 2018 Classic Sewing Magazine. Sometimes when you grab a pattern, fabrics and laces are an easy choice. This collection came together easily with this precious pattern. Preppy Plaid, gorgeous Swiss embroidered edging for the ruffle & pink matching buttons for the back of the dress. With the spring garment that was quickly coming together, we decided to take a trip to the Redcliffe Plantation in Beech Island, SC! This has such a beautiful background for a spring/summer look & is often used for special occasion pictures, such as weddings and graduations. Really, anything can be captured on its diverse landscapes, 150 year old oak & magnolia trees, & historic buildings! So the dresses were finished and the fun began with sweet sisters having a ‘Day at the Park’! After making up the pattern we had a little fun changing the way the ruffle was finished on the bottom of the strap. We can never leave anything the same, but are always experimenting! So, we can’t wait to see YOUR version of this adorable sundress! Send us pictures of your sweet girls in this summer sundress! Pattern is available in the Summer 2018 “Classic Sewing Magazine”, in stores now! Contrasting collars make for such a wonderful pop of color. When you find a beautiful coordinate, it can really make an outfit! Here we have used the Violette Field Threads PDF pattern ‘Pepper’ with a rich ‘flamingo’ sheen sateen and a perfectly paired Liberty of London linen floral for a contrasting collar. A neat sewing trick I learned from #1 sewing teacher, Cindy Foose, is to mark the center front of the bodice fabric with a temporary basting stitch. This provides a guideline for centering the collar, centering the skirt gathers, and a perfectly straight line to add tiny buttons as front embellishment. “Pepper” is shown on the pattern with 3/4 sleeves, and is adorable in that version, but Liberty Linen and Flamingo Sheen Sateen will be worn in the hot South Carolina summer, so I made this a sleeveless version. The bodice is fully lined, which made it easy to finish the armholes! Only a small amount of the contrasting floral linen is required to make the collar for “Pepper”. It is fun to use the more expensive fabrics as a pop of color on a garment! Here, the print is used for the collar, and a tiny piece used to cover the center of a little fabric bow for the front of the dress. Every scrap of Liberty fabric is precious, and a perfect way to use tiny pieces is to cover buttons! Since the metal from the cover buttons has a tendency to show through a more open weave fabric, I fused our French baby interfacing to the back of the fabric used to cover the buttons. (The same interfacing was used in the collar and under the back buttonhole and button area. I have rarely been known to “go with the flow” – and have often used shank buttons on the backs of little girls’ dresses, if I think they are pretty. I know it is frowned upon in some circles, so imagine my pleasure to see this magazine cover in the grocery store last night!!!! Shank (covered) Buttons on the Back!!! (Photo Props: Google Search :)) If it’s good enough for a princess, it’s good enough for me! Classic patterns are everywhere. Yet, a modern twist brings them alive again for a new generation. I find myself drawn towards vintage patterns, always circling back to them when I am looking for inspirations. This is a recent one that caught my eye! McCall’s #2664. I liked the “Princess” lines & deep pleats in the front, and with the back being A-line, the pattern went together very quickly! Normally, I use buttons for closures on the children’s clothing, but a back zipper made this dress really speedy! It was time for Christmas pictures, and I knew just where to turn. The setting for family photos was intended to depict the hunt for the perfect Christmas tree. Mommy asked for coordinating dresses for 2-year and 4-year old sisters. For outdoor pictures in winter, velveteen was a natural selection, and the rich colors of Liberty of London were a perfect coordinate. Although these little rascals were as children should be… not thoroughly excited to pose for pictures, we snagged a few that will make for beautiful memories! No winter season is complete without a picture with Santa, and every girl needs a new dress for that event! The McCall’s #2664 was such a fast a simple make, but I wanted it to look completely different from the green velvet. I liked the weight of the velveteen with the pattern and thought that a red ponte knit would be a similar weight and be as flattering as the green velveteen. To match Santa, I threw in a fun white boa, and the ‘Mrs. Santa Claus Dress’, as this fiery little red likes to say, was complete! ‘Cissy’ by a Wink & a Nod! “Cissy”, a sweet, versatile pattern that lends itself to all seasons and a wide range of fabrics from Liberty lawn to velveteen! The princess line is a flattering style for various sizes and shapes, as well!! ‘Cissy’ is our princess line, inaugural pattern that has been so fun to transform. Cissy as a blouse… To make this blouse, we shortened the skirt and cut the front neck straight across instead of using the sweetheart neckline shape. ‘The Classics of Yesterday back in full swing’! Corduroy floral (variation – front buttoning); Velveteen (variation – Beautiful Maline lace gathered at the sleeve); Pretty floral; Seersucker (variation – pockets with cute trim); Printed pique (variation – gathered Swiss edging at the sleeve edge). We would love to see YOUR variations of “Cissy”.